THE MOST entertaining aspect of the launch party for the Independent Group, a faction of seven disgruntled Labour MPs who split from the party on February 18th, was a second microphone that the BBC left running in the crowd. In rather blue language, a Labour-supporting voice muttered that because the party is “going to be so divided … the Conservatives are going to win”. The splitters have listed Jeremy Corbyn’s inadequate handling of Brexit and anti-Semitism within the party as the main reasons for their defection. Other Labour MPs who share these concerns are considering whether to join the mutiny. History suggests that the grumbling audience member might well be right. Labour last suffered such a schism in 1981, when 28 MPs jumped ship to form the Social Democratic Party (SDP), which campaigned in coalition with the Liberal Party. Labour was decimated at the next election in 1983. It won only 28% of seats, its lowest share since the second world war. Yet if such mutinies are brutal for the deserted party, they are even more cut-throat for the mutineers. The SDP-Liberal Alliance won 25% of the vote in 1983, but less than 4% of the seats. Britain’s combination of a first-past-the-post electoral system (rather than proportional representation) and unwavering party loyalty among voters makes such desertions akin to political suicide. Of the 28 Labour rebels who absconded to the SDP, only four were re-elected. A similar fate has befallen most other defectors since the second world war. 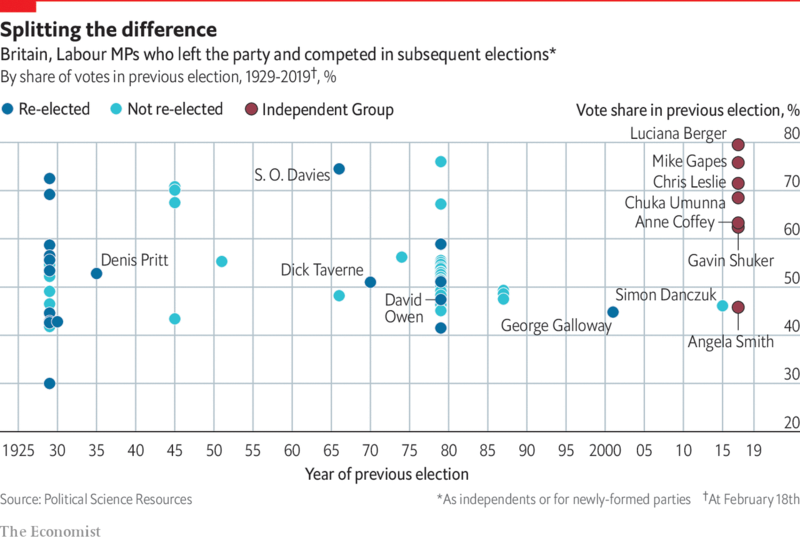 Excluding the SDP rebels, 16 former Labour MPs have stood for re-election in that period as independents or for newly-formed parties (including both those who were booted out and those who jumped ship of their own accord). Just three survived. Perhaps the only successful schism in the party’s history was the National Labour Organisation. Ramsay MacDonald founded the group in 1931, by encouraging a handful of Labour MPs to support his coalition government. Even that government-backed endeavour gained just 2% of seats, and fizzled out within a couple of election cycles. The Independent Group will doubtless hope that Brexit has scrambled party allegiances. If the splitters can pick up a few remainers from other parties, they might survive an exodus of loyal Labourites. But only two of the seven, Chuka Umunna and Luciana Berger, represent constituencies in which more than 60% of people voted to remain. If the others are to survive, they will need to overturn a century of gloomy precedent. Next PostNext Do voter ID laws reduce turnout among black Americans?